Finding polygons which are within/intersect other polygons using FME? I have two shapes with polygons. Now i want to locate those polygons of shape A (polygon.shp) which intersects polygons of Shape B (POLYGONS) (or are within them). Anyway, i did the same workflow to locate points/lines in the polygons with the PointOn/LineOnAreaOverlay Transformer. And it works perfectly. Anyone any ideas or improvement suggestions for the workbench? Performs an area-on-area overlay so that all input areas are intersected against each other and resultant area features are created and output. The resultant areas have all the attributes of all the original features in which they are contained. And the image shows that two features come in and three come out. If you want to output polygons from Shapefile A which intersect polygons from Shapefile B then I think the transformer you want is the SpatialFilter. You can test different types of spatial relationships. The default settings will probably suit your specific purposes. But I suggest reading the full documentation as this tool is very powerful. 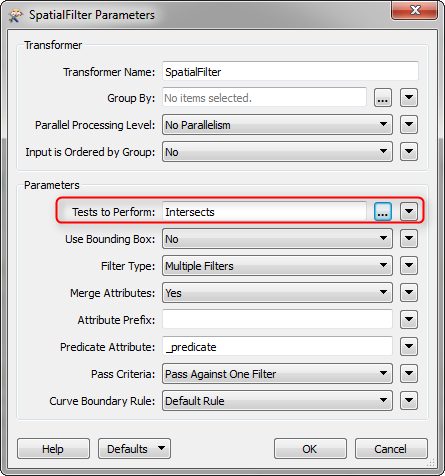 If you want to determine relationships between layers, then I recommend the SpatialRelator. That transformer adds an attribute with the spatial relationship. You might want to try using the SpatialRelater and the 'intersects' test. This will find (and associate) all the features in one layer that touch another layer. I hope it serves this idea. Without more information about your data sets and workspace its difficult to know why AreaOnAreaOverlayer isn't working as expected. Perhaps try side-stepping the need for the AreaOnAreaOverlayer in your workspace by putting one of your polygons through the CenterOfGravityReplacer and then using the resulting points along with your other polygon as the two inputs to another PointOnAreaOverlayer transformer. Not the answer you're looking for? Browse other questions tagged polygon fme workspace or ask your own question. 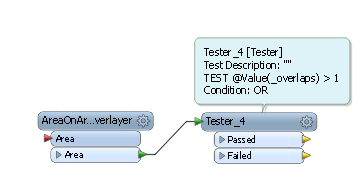 Why is geometry being dropped when outputting to a MapInfo Writer in FME? Connecting to lines, which are not spatially connected to each other, using FME? Finding values within intersecting polygons? Constraining Voronoi polygons to other layer using FME? Finding polygons that overlap other polygons within same layer using ArcPy?